In a Nutshell – Bravo Probiotic is a fermented dairy product with over 40 beneficial bacterial and yeast strains to give our immune systems a boost by promoting our natural production of GcMAF, an important immune protein that a healthy immune system naturally makes to fight off disease, unless this ability been switched off by an enzyme called Nagalase, which is produced by most cancers and viruses. So you have heard the term ‘Food is Medicine’? Well when I came across this product I thought we really were in danger of a health revolution! This knocks spots off any of the commercial probiotics on the shelves currently. The beauty of this product is its natural ability to strengthen the body’s immune system. It is entirely natural and is composed of a special protein molecules which when combined with oleic acid and vitamin D and the enzymes produced by the probiotic bacteria, is a substance called GcMAF, one of the most important componants of our immune system in the fight against cancer and viruses. The GcMAF Book by Timothy J Smith, M.D. Bravo is a complex multistrain bacterial fermentation process; it is not merely a probiotic and technically it is a fermented dairy product. Unlike other commercial fermented yoghurt products that contain two to six microbial strains, Bravo Probiotic Yoghurt contains 42 bacterial and yeast strains including important infant and commensal strains. The preparation process allows the natural production of several health boosting powerful bio-active molecules such as lactoferrins, immunoglobulins, noble proteins, anti-oxidants, vitamins and powerful immuno-stimulant factors (GcMAF) and may help to restore a healthy gut micro-biome. Tests on Bravo at a major university indicate it does not contain casein and other milk proteins after the bacteria have digested the milk during the fermentation process and in populations of people sensitive to lactose and A1 Casein, it has been very well tolerated. Apart from being one of the most controversial topics on the planet at present. 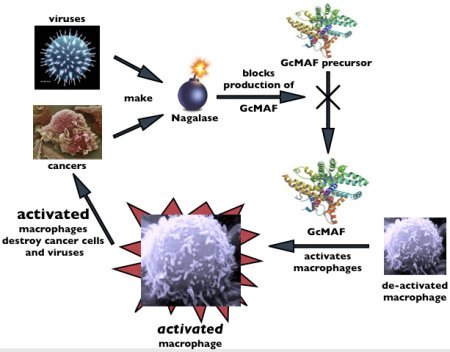 GcMAF is short for Gc Protein-derived Macrophage Activating Factor. Read more about the controversy here. GcMAF is a human protein, which occurs naturally in our bodies as a function of the immune system. It activates and instructs macrophages to destroy cancerous cells and foreign invaders such as viruses and a number of diseases and studies have been published in relation to Autoimmune diseases, Autism and other chronic illnesses including Cancer, HIV/Aids, Lymes and many more. Macrophages (Greek: big eaters) are a type of white blood cell found in the body and function as our defense system (our immunity). Their role is to attack foreign substances, infectious microbes and cancer cells through destruction and ingestion (phagocytize). They also stimulate other immune cells (lympocytes) to fight to disease-causing pathogens. How the body makes GcMAF to protect you from cancer and viruses? There is a protein called vitamin-D binding protein, (the Gcprotein also called a glycoprotein, because it is a protein with sugar molecules attached). It is a precursor of GcMAF and when tow of the sugars are removed (deglycosylation of the vitamin D-binding protein (the Gc protein)) Phewwww!…..stay with me the resulting protein is felt to be a macrophage activating factor (MAF). MAFs are a class of protein which “activate” macrophages, which can under the proper circumstances attack cancer cells and viruses. GcMAF – Picture fromThe GcMAF Book, Timothy J. Smith M.D. Nagalase is an enzyme (alpha-N-acetylgalactosaminidase), produced by many cancers and viruses, and it is known to block, the production of GcMAF. It has been suggested that nagalase may be beneficial biomarker in the future for health screening of cancer and viruses as it can be detected before the pathology is present. What is Bravo Probiotic Yoghurt? Bravo Yogurt has proven to produce GcMAF in a completely natural way. This GcMAF Probiotic Bravo Yogurt Kit contains 42 essential probiotics to restore healthy gut function and digestion. These 42 strains of probiotic bacteria have proven to produce the essential protein, GcMAF. This specific protein is necessary for Vitamin D to work in the body. Vitamin D is now recognized as the most important vitamin for optimal health. It has been proven to help restore health to the body and even prevent cancer. If you have used antibiotics or received vaccinations, Vitamin D3 along with these beneficial probiotics are a necessity for good health. Recent research studies have shown that active ingredients in Bravo Probiotic Yogurt have helped the body in healing ADHD, memory, autism, chronic fatigue and a host of other autoimmune conditions and chronic infections. Who would benefit from Bravo Probiotic? Bravo probiotic may be beneficial for anyone who would like to strengthen their immune system and prevent the onset of illness or disease, also for any persons who are known to have a weakened or compromised immune system. 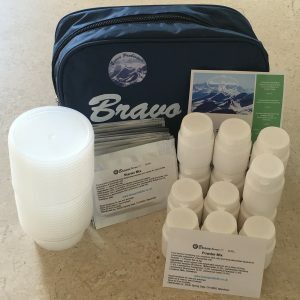 What is the Bravo Easy Kit? Bravo probiotic yogurt is designed not to be produced industrially and it cannot be found in supermarkets. The starter kits allows you to simply and conveniently make the Bravo Probiotic Yoghurt at home and is more cost effective than buying ready-made. Simply boil one litre of A2 casein milk (I recomned Jersey milk), allow to cool, skim and mix in the powders (included in the kit). Keep at room temperature and 48 hours later, you will have Bravo Probiotic Yoghurt ready to drink – which has a two-week shelf life. Unlike commercial fermented milk products that claim to stimulate the immune system and contain 2 to 6 microbial strains, BRAVO contains more than 40 microbial strains. All the strains of BRAVO are fully authorized and certified as appropriate and safe for human use by the European Food Safety Authority. Most of the species are from human origin and they have been tested as not pathogenic for humans. The statements and products referred to throughout this site have not been evaluated by the FDA. They are not intended to diagnose, treat, cure or prevent any disease. 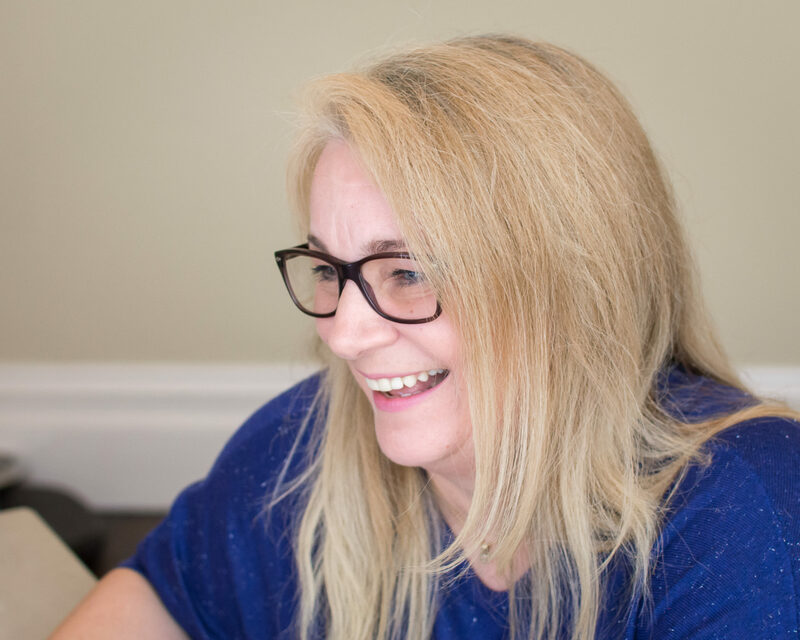 They are the expressed opinion of Kirsty Terry for the sole purpose of educating the public regarding their health, happiness and improved quality of relationships. Individual results may vary. Seek the advice of a competent health care professional for your specific health concerns. Hi there, I’m about to start my first lot of bravo yoghurt after being provided with a sample from a very good friend. Given I plan to start on a low dose, how long does the yoghurt last in the fridge? One the yogurt is made you have a chilled shelf-life of two weeks to use the yogurt. Thank you for your comment, yes!, you will find all the Bravo and MAFActive products on http://www.bravoprobiotic.co.uk.